In this post I aim to touch the surface for what is know as "regime change detection" or "trend change detecting" in the literature. I use a simple t-test and a rolling window approach to detect a regime change. This simple approach falls into general category of "sequential statistical tests" for regime change detection. It is also an online algorithm meaning that it can readily apply to new measurement and decide whether the same trend exist in new measurement or not. 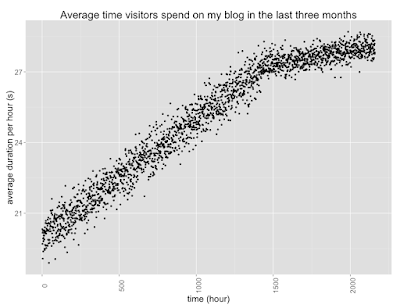 As an example and to have a semi-practical dataset, I use hourly measurement of average duration (in second) that a visitor spends on my blog. The data belongs to a three month period. For the purpose of this post the dataset has been cleaned up, slightly modified and more importantly seasonality has been removed. In summary, we are only focusing on the trend of session duration and the goal is to detect when this trend has changed. Clearly somewhere around 1500 hour, the average time spent on my blog is saturated. I believe the root cause is as follows: in the first two months I put some effort into spreading out my website by either asking people to go and visit it or by sharing it in different social medias. I guess after some point the blog has found its audience and my naive primitive advertising lost its effect. This is the point that the growth trend has stopped (I hope it starts growing again :] ). Let first describe the algorithm in simple words. We start by taking an initial window of data and assuming that the trend does not change in this initial window. This is the most tricky part. On one hand the size of the window needs to be large enough to establish a good model and on the other hand it should be small enough to not cover any trend change. We fit a line to this window of data. Then we pick some points after this window and call them test points. Using t-test we see if test points trend is statistically different from the trend of the points in the window. If that hyposis is rejected we add the test points to the current window and continue with a new set of test points. We continue that till we either find a point that the hypothesis is accepted or we reach end of dataset. As described in simple words, the following part is iterative. I removed the loop so that I can put some comments after each part. You can find the full code in my Github. Fit a line to current window. Although the modeling here is linear between x0 and y0 but it can simply be extended to nonlinear functions in x0. Pick a few data points as the test data and fit a line to the test set. 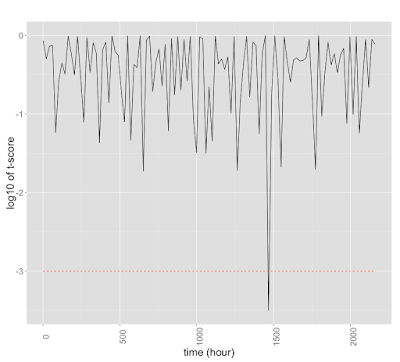 Red line shows the log10(p-value=0.001). p-value = 0.001 is very conservative. 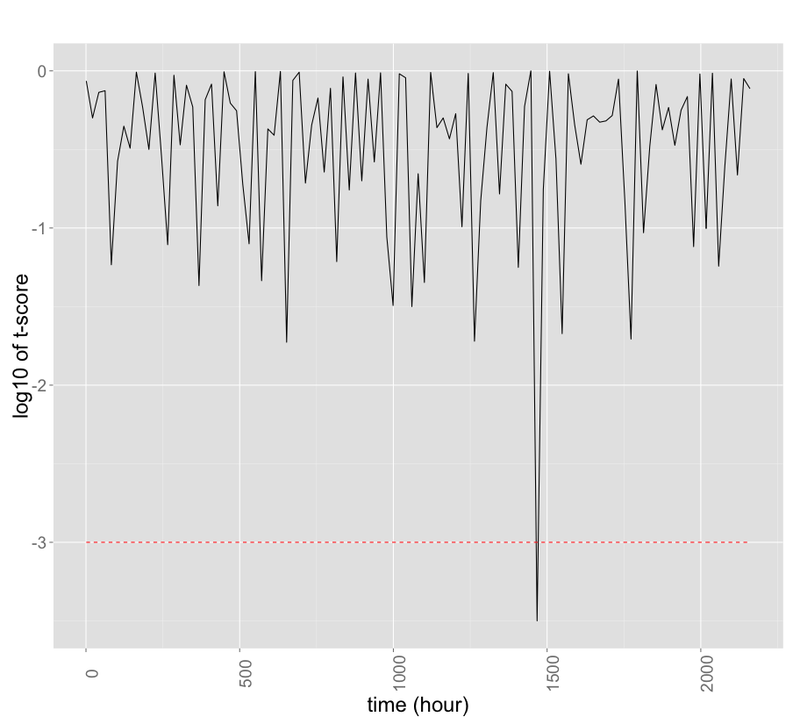 So the above algorithm detect that around 1460 hour there is a change in the regime which seems good enough. The below table shows the error for each dataset. You can download the dataset and give it a try. Hi Hamed, I have stock index data. How do I detect regimes in that data? Thanks.